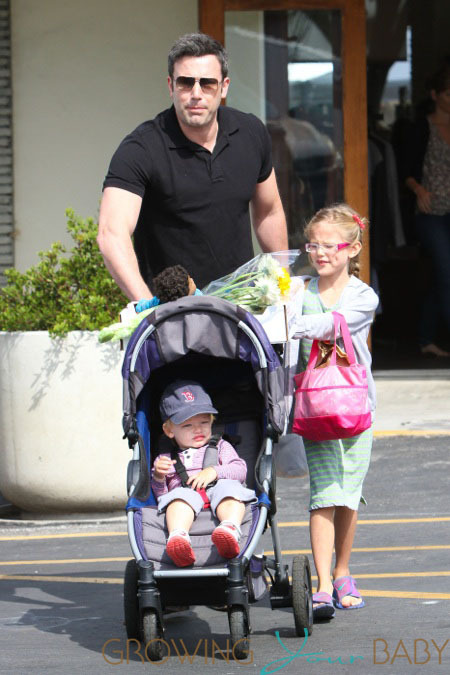 Ben Affleck and his wife Jennifer Garner stepped out morning with Violet and Samuel to stock the kitchen with fresh produce. Ben started the trip out carrying his son, but opted to use the Bob Motion 4 stroller to keep Sam comfy and hold their purchases. A market pro, Violet picked out some daisies, and also some fresh berries. Jen is currently working on Imagine along side Al Pacino. Ben will next direct, produce and star in Live by Night, an adaptation of the crime novel by the same name, written by Dennis Lehane. Selma Blair & Her Son Arthur Play At The Petting Zoo!